The indomitable, indefatigable, never-say-die UK Met Office (under the spell of the IPCC) predicts that warming is set to “continue”, even though there’s been no global warming to speak of for about 25 years. Wonderful. In fact, the entire UAH satellite dataset from December 1978 to November 2015 (37 years) shows global warming at a yawn-inducing rate of just 1.14°C per century, well within natural variability. Stupendous. In strong sycophantic voice, the Guardian trumpets the latest Met Office pronouncement of future warming (repeated uncritically by the Herald this morning) to fortify our delightful delusions of disaster. The only thing soaring has been an over-active imagination. Surprisingly, the Met Office identifies just two factors causing the earth’s temperature: human emissions of CO2 and El Nino (ENSO): one of so little effect it could be imaginary and the other powerful, wholly unpredictable but natural. Our best efforts against them would be ruinous but leave both of them untouched. According to the Met Office’s forecast for the next five years, 2016 is likely to be the warmest since records began. Ideologically-driven repetition of the lie that current temperatures are unprecedented does not improve the credibility of the lie. Numerous studies show global temperatures throughout the Holocene to have been higher than the present day. Some global warming deniers have claimed that the current El Niño alone was responsible for making last year a record one, with the effects of carbon emissions being irrelevant. But Smith [Dr Doug Smith, a Met Office expert on long-term forecasting] rejects these claims. That’s pretty rude. Dr Smith claims people with questions about the Met Office’s explanations are denying global warming. Curiously, I have questions about the next bit, so let’s see how it works. I’m fairly certain my questions neither depend on nor lead to a denial of global warming. Fair enough. Now here are my questions. How much warming was caused since 1997 (18 years) by human emissions? What was the total increase in global temperatures during that time? I believe the correspondence between atmospheric carbon dioxide and temperature change is nowhere near as certain as Smith makes out. 2017 is likely to see a dip in global temperatures. “We can be pretty sure there will be a drop that year,” added Smith. So he presumes to lecture us for creating dangerous temperatures over the next 85 years, but begs our forgiveness if he gets the temperatures wrong over just five years? I’d say his climate ignorance is exceeded only by his audacity. His long-term predictions must have greater margins of error than the short-term, but no forgiveness will be possible for getting it wrong—the enormous sacrifice he demands from us makes it impossible. One reason for such uncertainties is a lack of precise knowledge about the heating of the oceans. “If you want to measure climate change you need to have precise information about the total energy of the planet and most of that is stored in the ocean,” said Smith. The global mean surface temperature was the accepted metric of global warming when the UNFCCC was created. That’s how it was measured: atmospheric temperature at an altitude of two metres. Notice that it’s named the UN Framework Convention on Climate Change, not the UN Framework Convention on Ocean Warming UNFCOW). Only after the surface temperature refused to rise for many years did the warmists shift the emphasis to ocean heat content. That was to save face, whatever they say now, not to more accurately describe the science. 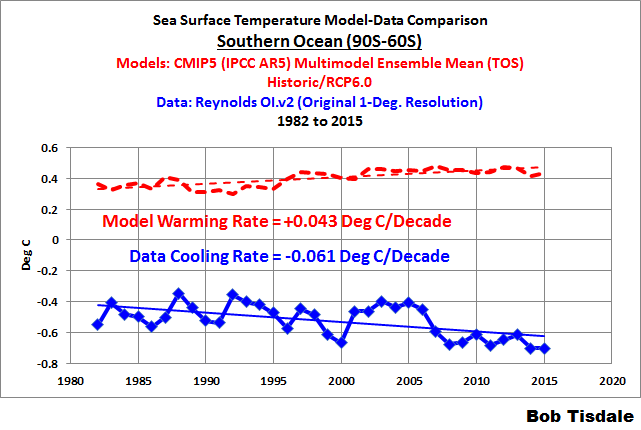 A “lack of precise knowledge” means Dr Smith knows nothing about the ocean heat content. Which is because we don’t have many thermometers in the ocean, especially at great depth, below 2000 metres. He’s making this stuff up. First, the Met Office (following IPCC) predict that temperatures by 2100 (pdf, 1.6 MB) could be 6°C higher than 1986–2005, and they don’t rule out 7°C or 8°C higher. Of course, that’s impossible, but he says our predictions for the next five years could be wrong (sorry!). Then he finally admits that to “measure” climate change you must know “precisely” the planet’s total energy, most of which is in the ocean, but he does not know how much it is. Which means his predictions for 2100 are fabricated. Concerning the ocean, he’s hopelessly out of his depth. So it did, but he should quantify it. Last year, Christopher Monckton used Argo data to show ocean heat content was indeed rising, but only at about 0.23°C per century. This is being caused by the sun, not by our minor additions to a trace atmospheric gas. Lord Monckton adds the following poignant facts about the Argo project to put the numbers into a realistic context. Actually, it is not known whether the ocean is warming: each of the 3600 automated ARGO bathythermograph buoys takes just three measurements a month in 200,000 cubic kilometres of ocean — roughly a 100,000-square-mile box more than 316 km square and 2 km deep. Plainly, the results on the basis of a resolution that sparse (which, as Willis Eschenbach puts it, is approximately the equivalent of trying to take a single temperature and salinity profile at a single point in Lake Superior less than once a year) are not going to be a lot better than guesswork. This gives a good picture of the enormous scarcity of temperature readings in the ocean, but warmists place great faith in data they agree with. Finally, the Guardian tries for a knockout punch to have us all believing in the coming cataclysm. The release of the Met Office study comes as another group of scientists revealed research that shows the last 30 years were probably the warmest Europe has experienced in more than two millennia. An international team used tree ring records and historical documents to reconstruct yearly temperatures going back 2,100 years and discovered there was no period as warm as the last 30 years. It’s amazing how research is catching up with ideology. Several recent studies have removed the Medieval warm period, the Roman warm period and the Minoan warm period—although some evidence shows almost the entire Holocene (pdf, 1.3 MB) was warmer than today. Yet the IPCC, in its first report in 1990, showed them clearly (https://www.ipcc.ch/ipccreports/far/wg_I/ipcc_far_wg_I_full_report.pdf, p.202). Hard to believe the data in papers from around the world supporting the temperatures in those periods were all incorrect. It’s more likely the IPCC looked elsewhere for different data, since higher temperatures only 700 years ago makes one’s claim of unprecedented temperatures seem false, if temperatures are not unprecedented they’re highly unlikely to be dangerous, and no doubt the IPCC tries very hard not to mislead. Ah yes, the serially bogus “decadal” forecast issued by the Met Office each year. It’s now only for 5 years at a time. They have to issue a new one each year because the previous forecast is always ridiculously high and at a trajectory far greater than the GCMs. Figure 3: Observed (black, from Met Office Hadley Centre, GISS and NCDC) and predicted (blue) global average annual surface temperature difference relative to 1981-2010. Previous predictions starting from November 1960, 1965, …, 2005 are shown in red, and 22 model simulations, from the Coupled Model Intercomparison Project phase 5 (CMIP5), that have not been initialised with observations are shown in green. In all cases, the shading represents the probable range, such that the observations are expected to lie within the shading 90% of the time. The most recent forecast (blue) starts from November 2015. All data are rolling 12-month mean values. The gap between the black curves and blue shading arises because the last observed value represents the period November 2014 to October 2015 whereas the first forecast period is November 2015 to October 2016. The previous ANNUAL 5-yr predictions are NOT all shown. Where is last year’s prediction? And the year before that? Different anomaly baselines but Indicates that the beginning of 2016 is just on the 0.5 anomaly in the composite prediction graph i.e. just below the top bound of the blue uncertainty. This corresponds to the bottom bound of the blue uncertainty at the end of the prediction October 2020. The chances of 2020 temperature being greater than or equal to the peak 2015 El Nino level are hopelessly remote. In the intervening time the conditions will first of all return to ENSO-neutral, as will temperatures. This corresponds to about the 0.5 anomaly in HadCRUT4 and about 0.25 in the composite prediction graph. Then as generally, but not necessarily, there will probably be a La Nina and a temperature response which could be around 0.4 on HadCRUT4 and about 0.15 on the composite graph at end of say 2017. That would be at or below the lower bound of the GREEN GCM range, let alone the blue 5-yr prediction range. The area of the earth’s surface producing the 2015 spike was only in the Northern Hemisphere and confined to the Pacific, Asia,and Eastern Russia. Now in early 2016 Asia is freezing at record levels in some parts i.e. global temperature will be at the bottom of the blue prediction band in very short time, probably in the first few months of 2016. 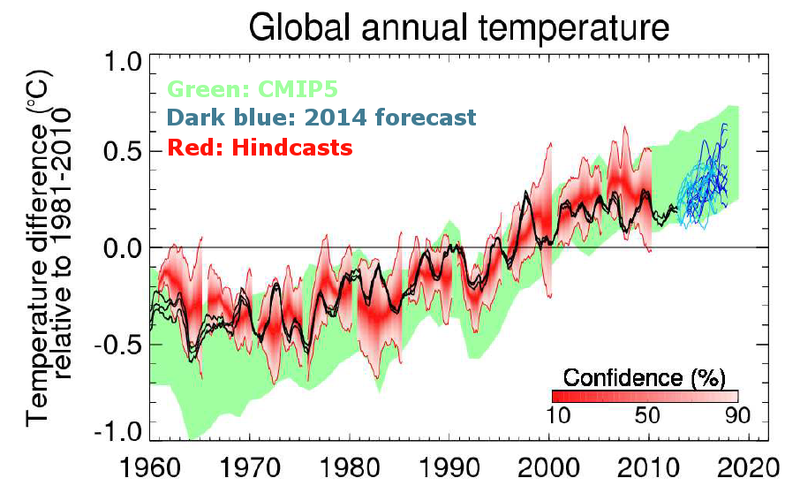 The has to be the Met Office’s stupidest 5-yr “decadal” prediction so far. [Smith] >2017 is likely to see a dip in global temperatures. “We can be pretty sure there will be a drop that year,” added Smith. After that, temperatures could start to rise again over the rest of the decade. “Whether one of these years — 2018, 2019, 2020 — overtakes 2016 in terms of temperature is very hard to predict at this stage,” said Smith. This is contradictory to their prediction graph. The central estimate for 2017 is at the same level as 2016 would be if they had plotted it. Then maybe not 2018 but the LOWER bound of 2019 and 2020 are BOTH higher than the 2016 level. Didn’t Smith look at his office graph before he opened his mouth? And yes, this in respect to 5 years ahead is absurd: ““We are looking quite far into the future, after all”. Is Smith unaware that the green GCM “projections” do not stop at 2020? That was when the Met Office surreptitiously published their radically lowered forecast on Christmas Eve 2012 when people were busy doing other stuff. A week into the new year and they were sprung. 1.14°C per century is hardly yawn-inducing. 2°C since pre-industrial times is considered by many to be the maximum ‘safe’ warming that can occur and we are already over 1°C. You seem to be accusing the Met Office of lying, without saying what was factually incorrect. Discerning a trend is different from making an exact prediction about a single instance of time. Monckton’s point is trite, 3600 data points are sufficient, what is lacking is the long time series for comparison. Professor Bowman said the latest fire was different. When bushfires hit the Blue Mountains in October 2013 he was wary of linking them to man-made climate change due to the large historic variability in Australian fire seasons, but understanding of fire ecology had developed rapidly, and scientists were now more confident global warming was increasing fire risk. “This is completely consistent with predictions. It was lit by lightning and it is incredibly dry and warm in western Tasmania by historic standards,” he said. Much has changed since 2013 apparently. 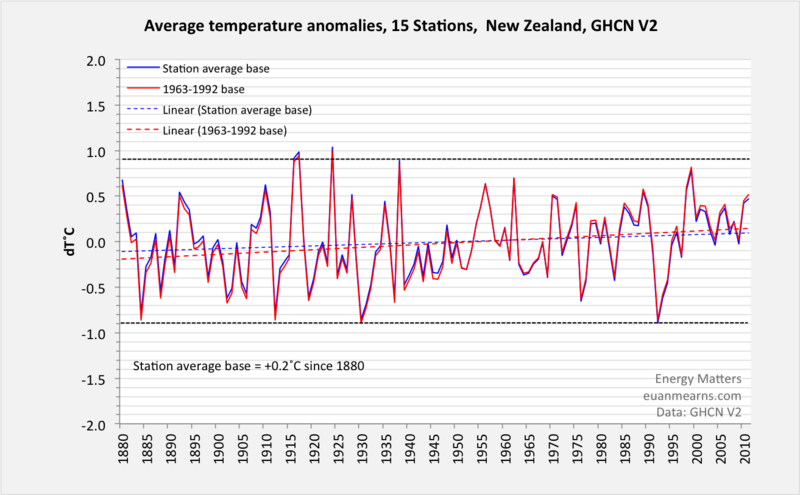 NZ was 27th warmest since 1909 according to NIWA. That leaves Asia (and eastern Russia missed by Schmidt and Karl, and NH Pacific). But now Asia is freezing with places like Vietnam and tropical Taiwan experiencing record low temperatures. So not only was the 2015 warmest ever record NOT global but it is now totally irrelevant in the regional area that produced it. Asia would gladly have last years temperatures right now. And yet Foster retains the 2 month spike representing the entire year – what a phony. In the Southern Latitudes the anomaly was actually DOWN on recent years i.e. there was no “record-shattering global warm temperatures in 2015” (NASA GISS) in the SH Extratropics (Southern Latitudes). Obviously that’s not a god look so now they just blob the lot – no trend or points. A kid with a crayon could do that. Just a normal La Niña would return the climate to a flat trajectory within the next two years. A ” very sudden return to La Niña” would kill the negligible 15 yr warming trend stone dead i.e. cooling instead. This is just wishful thinking. Thing is, if the current flat ENSO-neutral trajectory continues to 2020 the entire man-made climate change conjecture would be killed stone dead. This is highly problematic for the warmies, they’re in for a rude shock over the next 2 years. 1970 to 2000 is +0.26 per decade in CRUTEM4. By 2017, with ENZO-neutral or a La Nina, how is a +0.15 ten year rate (or a +0.127 per decade 15 yr rate) going to increase to +0.26 per decade in just 2 yrs? They seem to be anticipating another strong El Nino back-to-back with 2015/6. News to me. [RT] >”Now here are my questions. How much warming was caused since 1997 (18 years) by human emissions? Simon. You haven’t answered either of RT’s questions. You’ve answered your strawman’s question. If they predict that the ten year trend will change radically in only 2 years (a), the 15 year trend would change considerably in the same 2 years too (b). One does not change independently of the other in different timeframes unless the radical change occurs in the additional 5 years of (b) PRIOR to the ten year period (a). The latter (b) just adds 5 years to the former (a) and any radical change is (a) is of necessity simultaneous in (b). And again, wishful thinking in (a). +0.153 per decade – last 10 yr.
+0.127 per decade – last 15 yr. They are seriously deluded if they think +0.153 will increase to +0.26 in only 2 years, contrary to ENSO, without having to think about how +0.127 will “respond” if it did. A rate of change higher than this over a shorter time frame is still consistent with this. 58% chance of a La Niña by around October this year but in the face of this contra indication, the Met Office is implying, inexplicably, that the ten year trend in the global temperature metric, say CRUTEM4 upthread, will increase by a factor of 1.7 in the next 2 years and the 15 year trend will double following. I’m seeing a gaping credibility gap in the Met Office prediction. A Very Strong La Nina easily has the potential to wipe out the last 15 yr +0.127 per decade trend (which has still to increase a little before neutral conditions return), and a Strong to decrease it somewhat. Even a Weak or Moderate La Nina will in no way increase the 15 yr trend, it might sustain it but it certainly wont double it. WoodForTrees HadCRUT4 data is not up to date but it is obvious that these are radically different profiles (different baselines are irrelevant to this), and GISTEMP+NCDC will have the overwhelming influence in a composite profile. This is basically the data without ENSO noise. The modeled Pacific Ocean surface signature patterns of temperature in both hemispheres including the equatorial zones decay rapidly, and are poorly represented by the GCMs after only a year. Re-initialization appears to apply to those temperatures, if I’m not mistaken. Only then can the models lurch forward again for a few months of potentially plausible forecasting. Now that the process of CMIP validation via initializations has been institutionalized, climate change scientists apparently believe that there is no further need for actual experiments, calibration reports, or any other customary transparency. Rather, so long as the money flows, the latest observations will continue to be fed into the CMIP machine at one end. The other end will continue to emit long term climate forecasts for all locations, modalities and scales. The deployment of these inaccurate results will continue then to grow in cost and scope around the world. In the email sent out to staff on Thursday morning, CSIRO’s chief executive Larry Marshall indicated that, since climate change had been established, further work in the area would be a reduced priority. Worked themselves out of a job. Apparently it’s OK for engineers (some of which is modeling) and construction workers whose jobs end when a project is finished but climate modelers? No, that’s a continual work-in-progress – there’s CMIP6 to be cranked out, then CMIP7, after that CMIP8……..
Don’t know the basics yet? So what exactly are we “deniers” of then? Compared to seasonal norms, the warmest average temperature anomaly on Earth in January was over north central Russia, near the small town of Volochanka. January temperatures there averaged 7.20 C (almost 13 degrees F) warmer than seasonal norms. Compared to seasonal norms, the coolest average temperature on Earth in January was over the northern Pacific Ocean, where the average January 2016 temperature was 2.78 C (just over 5 degrees F) cooler than normal. Still a Northern Hemisphere phenomenon, warmest in north central Russia. But coolest over the northern Pacific Ocean? How do we measure the rate of global warming? Traditionally, we tend to think of Earth’s global surface temperature as the iconic indicator of climate change. However, in a new perspective piece in Nature Climate Change, scientists argue that there is a more fundamental measure of climate variability and the rate of global change: Earth’s energy imbalance. As the article explains, all the energy that enters or leaves the climate system does so radiatively at the top of Earth’s atmosphere (Figure 1). Under an equilibrium climate, the solar radiation absorbed by the Earth is balanced by emitted longwave radiation. Increased greenhouse gases reduce the emitted longwave radiation and give rise to Earth’s energy imbalance, leading to excess solar energy accumulating in the climate system. This is the most fundamental driver of observed climate change, and the various climate impacts that we are familiar with – such as warmer surface temperatures, sea level rise and loss of land-based ice – are all symptoms of the energy imbalance. Something else that is not yet fully reconciled is TOA imbalance from man-made climate change theory (2.4+ W.m-2) vs TOA imbalance from observations (0.6 W.m-2). on responding to the CSIRO cuts. How does one “prove” climate change? Given that “climate change” isn’t even defined as a consistent concept, it would appear to be a little hard to “prove” it. Anyway, proof is something that is generally used in mathematics. Science does not generally deal in proofs, more in falsifiable conjectures. Is he saying expect even lower than the 80% level? If so he implies AGW cannot sustain the level he claimed previously. Why not? El Nino temperature spikes return to neutral after ENSO-neutral conditions return. That means the entire spike is wiped out. Then if a La Nina follows, which is a strong possibility, temperatures go below neutral. 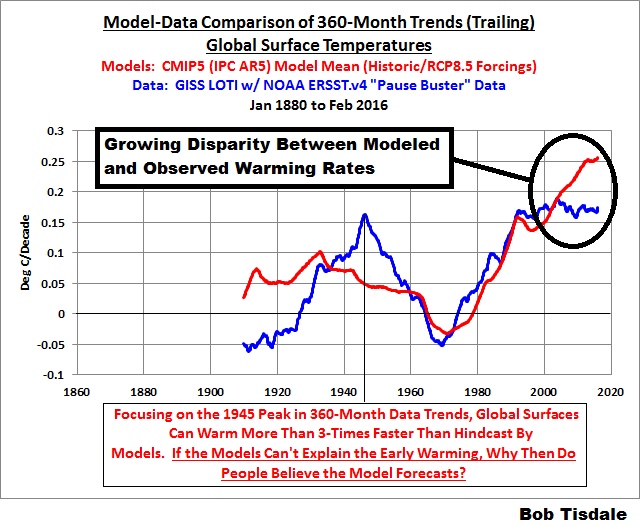 STATISTICAL FORECASTING How fast will future warming be? needs to be based on objective grounds. long-term warming in the winter months but not in the summer. accompanied by 95% forecast intervals. Terence C. Mills just elevated himself to warmist enemy #1. Written by Ben Webster, The Australian on 23 February 2016. He found that the average temperature had fluctuated over the past 160 years, with long periods of cooling after decades of warming. Dr Mills said scientists who argued that global warming was an acute risk to the planet tended to focus on the period from 1975-98, when the temperature rose by about 0.5C. He found the average winter temperature in central England, which has the world’s longest temperature records going back to 1659, had increased by about 1C over 350 years. Based on that change, he forecast an additional increase of about 0.25C by 2100. He said the average temperature would continue to be “buffeted about by big shocks” caused by natural events, such as the El Nino weather phenomenon. The Global Warming Policy Foundation is a think tank founded by Lord Lawson of Blaby, a former chancellor, to challenge mainstream climate change theory. The foundation paid Professor Mills £3,000 to write the report, which it said was its standard fee. Now sit back and watch the sparks fly. This media attention must be anathema to warmies. Firstly, climate scientists agree that global warming has not ‘stopped’ – global surface temperatures and ocean heat content have continued to increase, sea levels are still rising, and the planet is retaining ~0.5 days of the sun’s incoming energy per year. I think there is also broad agreement that climate scientists have probably not chosen the right words (e.g. ‘hiatus’) to describe the temporary slowdown, especially when talking to the media and the public. 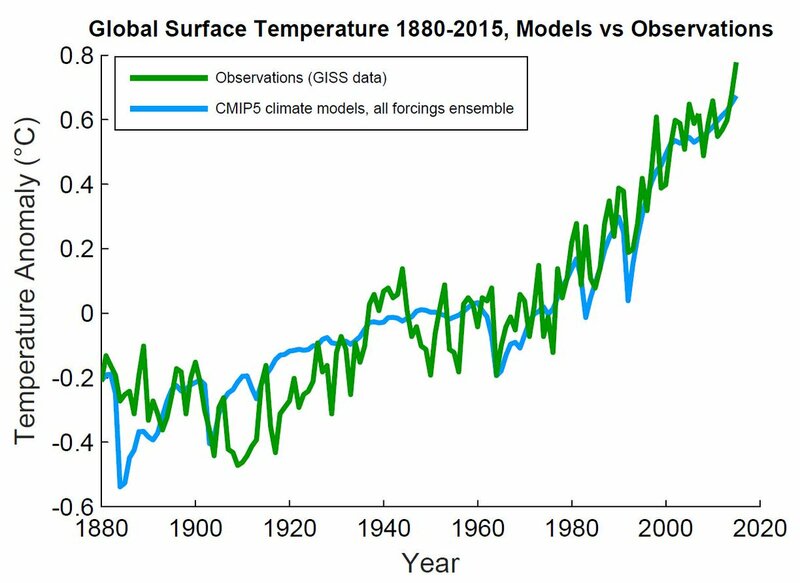 However, there has very clearly been a change in the rate of global surface warming. There are clear fluctuations in the rate of global temperature change in the past. We also expect similar fluctuations in future – global temperatures will not increase smoothly or linearly. Just focusing on the observations, the most recent observed 15-year trends are all positive, but lower than most previous similar trends in the past few decades. This is a clear demonstration that the rate of change has slowed since its peak. 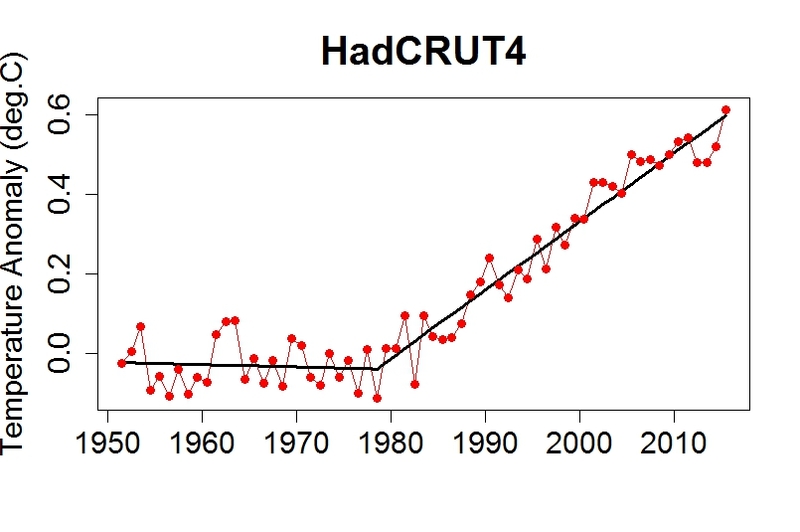 The absolute value of the trend is not really relevant for such an assessment – it is far more instructive to examine how global temperatures have changed relative to our expectations, as represented by the CMIP5 simulations, for example. Observations should fall outside the simulated spread sporadically because of internal variability – we do not expect the observations to always match the ensemble mean. However, the recent observations are all continuously outside the ±1σ spread of the simulations for a lengthy period, which is obviously unusual. It is also not just global temperatures that have been unusual – the tropical Pacific sea surface temperatures & winds have also behaved well outside the simulated range. These analyses all suggest that the early-2000s were indeed ‘particularly unusual’ – so we strongly dispute Lewandowsky et al.’s statement quoted above. Reality has deviated from our expectations – it is perfectly normal (& indeed essential) to try and understand this difference. Oddly, Lewandowsky et al. seem to disagree, suggesting that trying to explain this event “departs from long-standing practice“, which I think is utterly bizarre and simply wrong. Note that there are important issues with the radiative forcings used in CMIP5 (particularly solar & volcanic), which do not necessarily match the real world, especially after 2005. I hope that at least some CMIP5 models will be rerun with the updated CMIP6 forcings to determine the size of this effect. In addition, when an ‘apples-to-apples’ comparison is performed, the consistency between observations and simulations is much improved. This type of research has been valuable and is ongoing. Finally, the issue of natural variability merits further discussion. The 1972-2001 period shows higher ratios (more warming per unit forcing) than the other periods. This period also corresponds to when the Pacific Decadal Oscillation was in its positive phase, suggesting that these variations in the Pacific have caused a large part of the difference between models and observations. Overall, there is compelling evidence that there has been a temporary slowdown in observed global surface warming, especially when examined relative to our expectations, which can be explained by a combination of factors. Research into the nature and causes of this event has triggered improved understanding of observational biases, radiative forcing and internal variability. This has led to more widespread recognition that modulation by internal variability is large enough to produce a significantly reduced rate of surface temperature increase for a decade or even more — particularly if internal variability is augmented by the externally driven cooling caused by a succession of volcanic eruptions. The legacy of this new understanding will certainly outlive the recent warming slowdown. For the record, much chortling in the Guardian from Nuccitelli and Schmidt, Betts and Hawkins (the latter co-authors of Fyfe et al just upthread and see below) re the Mills/GWPF statistical forecast model (see just upthread. This in respect to the 2015 El Nino spike. Schmidt’s own GISTEMP monthly shows the peak has passed and current temps well on the way back into the predicted range. Mirth will be short-lived in other words. Schmidt claimed all but 0.07C of the El Nino spike for AGW (see upthread and ‘2015 warmest’ post) so he’ll have problems of his own very soon. Expect some back-peddling. 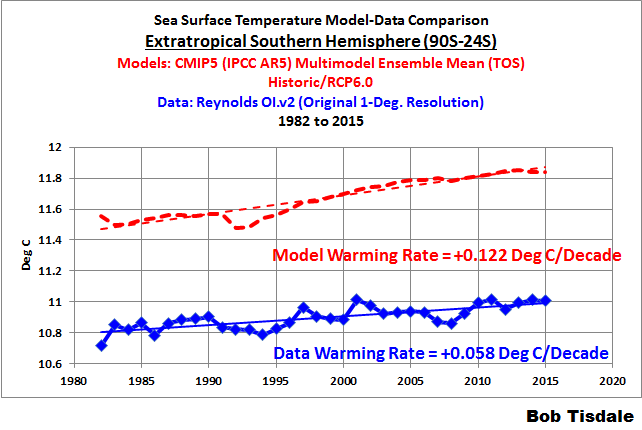 Although their statistical ARIMA models use “CMIP5 all-forcing”, that is NOT the global climate model profile. So for the Nuccitelli article’s purposes (and Mann et al’s), the GCMs are thrown under a bus.. Also, the Mann et al statistical models will not forecast the 2015 El Nino spike either. 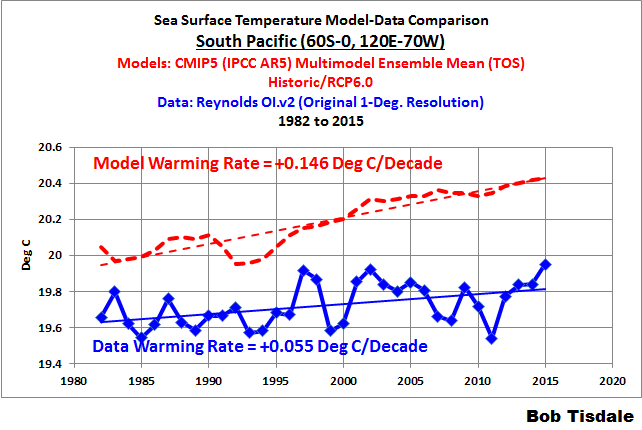 Perfectly obvious from Figure 1 (d & f ) that the GCM CMIP5 30 and 50 yr model trends are too warm. Nuccitelli’s Guardian article will be a very useful “bring-up” over the next 4-5 years to 2020. Fyfe et al is already being cited in the comment thread – that must hurt. The “Pause” in global warming is real – not an urban myth concocted by evil ‘deniers’ – a study [Fyfe et al – see link below] has found, signalling the development of a major schism within the climate alarmist camp. Though the paper’s findings are not controversial – few serious scientists dispute the evidence of the temperature datasets showing that there has been little if any global warming for nearly 19 years – they represent a tremendous blow to the climate alarmist “consensus”, which has long sought to deny the “Pause’s” existence. First, the study was published in Nature Climate Change a fervently alarmist journal which rarely if ever runs papers that cast doubt on the man-made-global-warming scare narrative. Secondly, it directly contradicts a widely-reported study produced by the National Oceanic and Atmospheric Administration (NOAA) last year which attempted to deny the existence of the “Pause” (also known as the “hiatus”). This NOAA study was widely mocked, quickly debunked and is now the subject of a Congressional investigation by Rep. Lamar Smith (R-TX). What’s novel about this new study in Nature Climate Change, though, is that it’s not skeptics and Republicans doing the mocking and the debunking: it’s the kind of people who in the past were very much in the alarmist camp, including – bizarrely – none other than Michael “Hockey Stick” Mann, who co-authored the paper. What we have here, in other words, is signs of a major rift within the climate alarmist camp with different factions adopting different tactics to cope with the failure of their collapsing narrative. On one side are people like Thomas Karl and Thomas Petersen, the hapless NOAA scientists given the unenviable task of producing that risible paper last year which did its best to deny that the Pause was a thing. On the other are what might be called the “rats deserting the sinking ship” faction who have produced this new paper for Nature Climate Change, in which finally they concede what skeptics have been saying for many years: that there has been no “global warming” since 1998. This divergence in the alarmist camp is now going to create a dilemma for all those liberal media outlets – from the BBC to the Guardian to the LA Times – which reported on NOAA’s “death of the pause” study as if it were a reliable and credible thing. Are they now going to report on the counter-narrative? Or are they going to ignore it and hope no one notices? The man who would like more than anyone to know the answer to this question is David Whitehouse, Science Editor of the Global Warming Policy Foundation and a former science editor at the BBC (till the point when his skepticism became too much for his employer). That’s because in 2007, he was one of the first scientists to draw attention to the mysterious slowdown in global warming. In 2007 I pointed out that it was curious that in recent years the global annual average temperature had not increased at a time when greenhouse gasses were increasing rapidly and when the media was full of claims that the earth’s temperature was getting higher and higher. I proposed no explanation but said that it was a curious observation that would probably change in the near future. I was lambasted for being a denier and liar. Yet in the following years the global temperature did not increase. Some vocal scientists spent more time saying it was wrong than actually looking at the data. While many in the media portrayed the phenomenon as a desperate weapon used by sceptics to undermine climate science, real scientists took notice and began to study the warming pause. It was not long before it was being discussed at conferences and in scientific journals. Something was clearly different about the nature of global temperature change since 1997 than it had been in the previous two decades. It was not only slower, but not increasing at all for many years. Indeed it was said in the prestigious scientific journal Nature that the “pause” or “hiatus” is the biggest problem in climate science. Whitehouse is too polite to name the alarmist shills and activist attack dogs who have fought so hard over the years to discredit anyone who has dared suggest the existence of a Pause. So I will. But in a separate article. It seems to me that these people are so disgusting, corrupt, nauseating and malign that they shouldn’t simply be tacked on to the end of a news story. They should be made to perform the internet equivalent of Cersei’s Walk of Shame; or, at the very least, to be put in the stocks and pelted with excrement. In the meantime let us all draw comfort from the fact that a) the alarmists are finally being forced to concede that their skeptic adversaries are right and b) that they are starting to turn on one another. This is the beginning of the end for the alarmist “consensus”. And not before time. Most of the world’s major news outlets that reported last year that the warming hiatus never existed have so far ignored the new findings. It will be interesting to see how long they will keep mum. Except the rats have only jumped on some floating debris, they haven’t mustered the courage to make for dry land just yet. And Adam Scaife and Peter Stott UK Met Office (see link), and Grant Foster (in same CCG thread at link). Thomas Karl, Thomas Petersen, Gavin Schmidt, Adam Scaife, Peter Stott, Stefan Rahmstorf and Grant Foster. Huge divergence in NH SST from 2000 onwards but SH essentially flat. Hence the illusion that 21st century warming is “global” and “shocking”. GISTEMP LOTI is basically just tracking NH SST. The illusion is complete. I don’t know why this is the case. 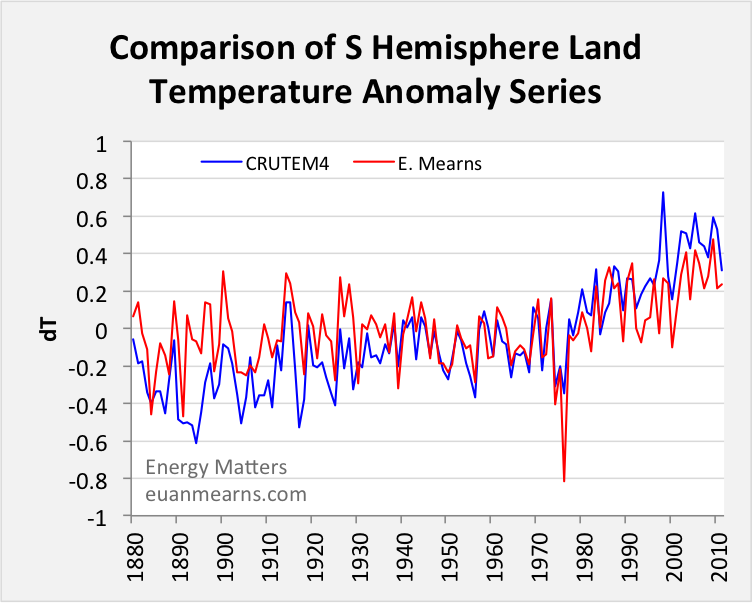 I suppose that because NH SST warmed, NH land warmed also. And there’s more land in the NH than SH. Conversely, SH SST didn’t warm so SH land didn’t warm either. And there’s less land in the SH than NH. Goes to show that a globally averaged Land+Ocean metric is a complete misrepresentation of the earth’s surface temperature. 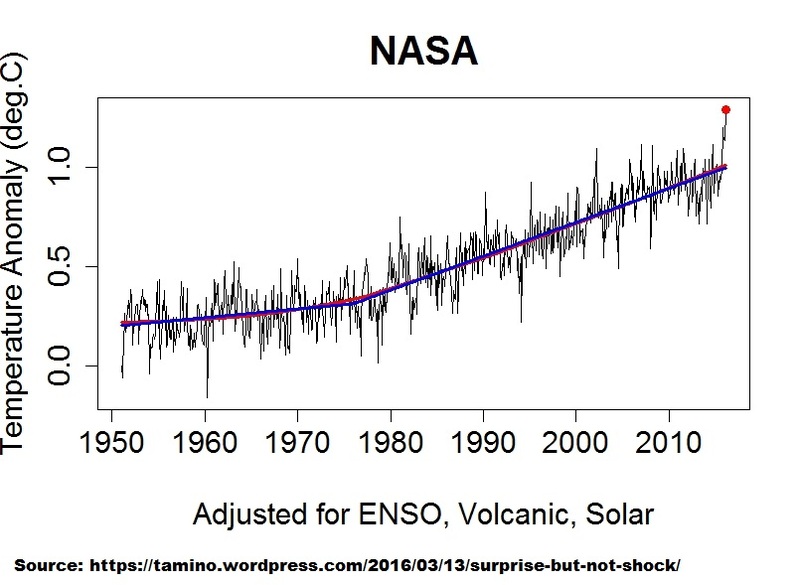 The “global record” 2015 anomaly does not show up at all in the SH metric. The globally averaged Land+Ocean GISS LOTI, HadCRUT4, and NCDC/NCEI metrics are just a useless illusion – except for ideological purposes. You seem to have troubling grasping the concept of mean or average. The existence of data points below the mean does not invalidate the central estimate. Global climate models predict faster warming in northern boreal regions, which is exactly what is happening. It does at the end of a series if the series isn’t linear in nature i.e. where a linear trend is statistically inappropriate. For example, Wellington tide guage data (PSMSL) is linear in nature over the entire series in the long-term so it is reasonable to extrapolate the data even though there is some intermediate fluctuation. So yes, you are correct in that case Simon. But if the data is NOT linear in nature, you’re dead wrong. Grant Foster and Stefan Rahmstorf were caught out in this way by data subsequent to 2010 in their 2011 paper, Hence Foster’s NEW model of residuals which differs from OLD. I’m assuming you are alluding to my critique of Foster & Rahmstorf (2011) and Tamino’s post because you don’t actually refer to anything in particular. Correct me if I misconstrue, it’s hard to know what you’re on about exactly if you don’t explain yourself. Clearly temperature data is not linear in nature. The secular trend certainly is not linear over the observational era and there is an oscillatory overlay which is basically a trendless sine wave. But ONLY in NH data. Comments upthread demonstrate that GSMT is skewed by NH temperature over land. The same NH characteristics are NOT evident in the Southern Hemisphere. The most recent “record warm” spike has not been a detectable feature in the SH. See GISTEMP SH Extratropics data, 2015 anomaly was fractionally LESS than 1980. In other words, “global” warming post 2000 is simply a NH phenomenon only. Not so in 1998. Before you object to the offsets, I’ve aligned the GMAST LOTI datasets with SST at the start of the series simply to demonstrate that the profiles track NH SST after diverging at 2000. If the NH land component was not the factor that skews GMST then GMST would track HadSST GL midway between SST NH and SST SH. But both GISTEMP and HadCRUT4 track HadSST3 NH. It’s the same with the globally averaged OHC metric. You are effectively just looking at Indian Ocean OHC. The short answer is “no”. If a signal is ever to be detected we will have to wait decades. Even then it is clear from long-running tide guage trend analysis (see 50 yr analysis NOAA Tides and Currents) that rates of sea level rise were far greater back in the mid 20th century that they are today i.e. for an anthro signal to emerge, it must emerge out of past variation too. But main point re the paper however is that maybe more than a third of the Pacific as measured by satellite exhibits sea level FALL over 1993 – 2013 in Figure 1(a)/(b), much of that statistically significant. It is the relatively small areas of marked rise that skew the metric. So now the question is: is the satellite MSL data for the Pacific essentially linear or not on a century scale if part is rising and the other part falling over 20 yrs? In short, global average is meaningless. And the man-made climate change conjecture is even more meaningless in regional breakdowns. And trends MUST be appropriate and relevant, linear can either be appropriate or erroneous. Yes you are looking at GISTEMP. No you are not looking at CMIP5 model output. You are looking at “adjusted” model output i.e. a residual. “It is critical to take into account these contributions in estimating the likelihood of record temperature values. One body of past work5,6,7 has employed model-based fingerprint detection methods to study temperature extremes in a generic sense, though without any focus on the types of questions posed here (i.e. the likelihoods of specific observed runs of record warmth). In this approach, natural variability is estimated from the climate models themselves, which means that assessments of the likelihood of extremes is dependent on the models producing realistic natural variability. Another past study8 estimated the parameters of statistical noise models directly from the instrumental temperature record, without the use of information from climate models. Not accounting for the impact of anthropogenic climate change on surface temperatures, however, could yield biased estimates of the noise parameters (e.g. by overestimating the apparent degree of natural persistence and, hence, the likelihoods of sequences of rare events). Moreover, such an approach cannot distinguish between the influence of forced and purely internal natural variability. Here, we instead use a semi-empirical method that combines the most recent (CMIP5)9 multimodel suite of climate model simulations with observational temperature data to estimate the noise characteristics of global and hemispheric temperature variabilty. It is totally unnecessary to make recourse to climate models in order to eliminate “noise” from GMST e.g. minor fluctuations, ENSO activity, MDV. But Mann et al left GMST as-is, instead “adjusting” the model mean. This is bogus. The models do a good job but only up until 1955. After that the unadjusted CMIP5 MDV-neutral ENSO-neutral model mean SHOULD pass through MDV-neutral ENSO-neutral 1985 and 2015 observations (the GMST spline), clearly it doesn’t. Sherwood, Mann, Rahmstorf, Steinman, Tingley & Miller are dead wrong. ALL absolute model temperatures are too warm by 0.8, 0.6, and 1.0 C respectively. 1) The 2015 cooling down to 500m in the IPWR (Figure 6) is by far the most cooling in the ARGO era. 2) The heat that was in the IPWR is now in the troposphere. 3) “Heat trapping greenhouse gasses” will not “trap” the heat in the troposphere, from there it will dissipate to space in accordance with the Kelvin-Planck statement of the Second Law of Thermodynamics. 4) The IPWR will no longer support tropospheric temperature since it has cooled radically i.e. after tropospheric warming in the NH (where the spike occurred) there will be tropospheric cooling. Possibly radical La Nina cooling but not from the IPWR which warms in a La Nina..
5) It is all a natural process of energy accumulation and dissipation. 6) Attempts to conflate this process with AGW are thermodynamically illiterate. The tropospheric “warming”, however radical it may be, is actually part of a dissipatory COOLING process. Where did the “catch-up” heat in the air come from? The sea, which cooled. Where will the “catch-up” heat in the air go to? To space, the air will cool. I wonder what these idiots will be saying when neutral conditions return at the end of the El Nino – La Nina sequence? In recent months I’ve had a series of posts looking at the temperature histories of a number of land areas in the Southern Hemisphere [1, 2, 3, 4, 5]. This was in response to a post by Roger Andrews where he presented an analysis of about 300 climate stations from the Southern Hemisphere that, when combined, showed substantially less warming than the reconstructions presented by various groups (BEST, GISS, HadCRUT) . I found this to be both intriguing and important and wanted to see if I could replicate Roger’s result. Figure 1 Note that this chart has an expanded Y-axis scale and the grid lines are at 0.1˚C intervals. 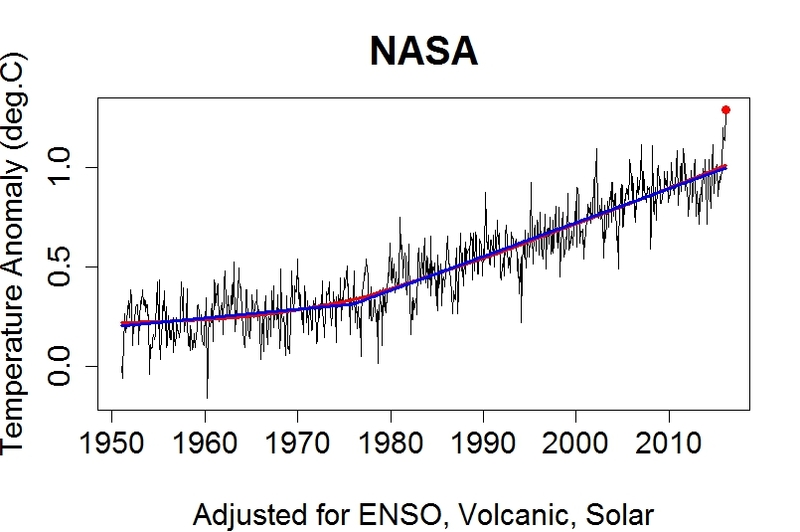 A regression through all the data using station average as the base indicates warming of +0.18˚C per century, i.e. close to zero. The black trend lines are parallel to the regression and show there are rising tops and bottoms in an overall slowly rising trend. The alternative view is a flat trend from 1880 to the mid-1970s with a step change to warmer temperatures across the mid-1970s cold snap. 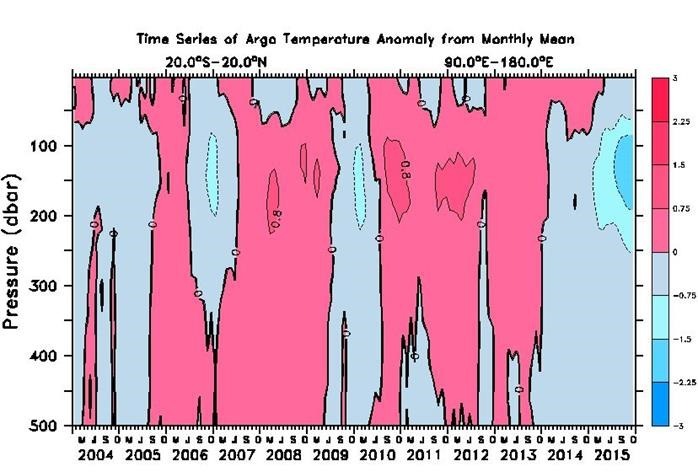 # The average time-temperature anomaly series for 174 climate stations from New Zealand, Central Australia , Southern Africa [2,3], Patagonia , Paraguay and Antarctica  are presented in Figure 1. A simple regression through the data with no weighting indicates warming of +0.23˚C since 1880 equivalent to +0.18˚C per century. 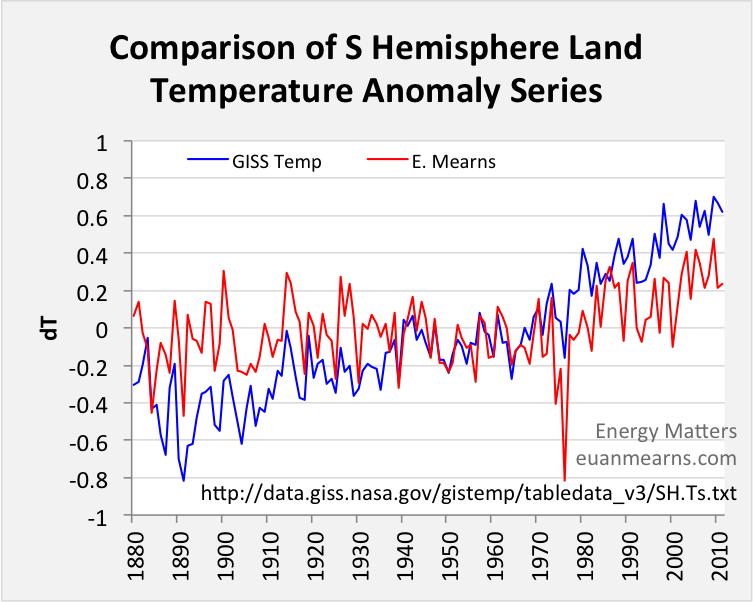 This is substantially less than S hemisphere land temperature reconstructions reported by BEST, GISS and HadCRUT. # Comparing with Roger Andrews’ reconstruction the difference is less than 0.1˚C. I have managed to replicate Roger’s result. # My default method is to use each station’s average temperature as a base for calculating anomalies. All anomalies have also been calculated using a fixed base period of 1963 to 1992. Doing so makes no material difference. Warming is reduced to +0.21˚C since 1880 using the fixed base. # Area weighting the results produces a trend of +0.19˚C warming since 1880. Area weighting lends substantial weight to Antarctica (only 14 records) where the main data series begin in 1954 and possible methodological problems are identified with lending 55% weight to only 14 stations with records that begin in the mid point of the time series. # The mid-1970s stand out as an anomalous cool period seen in records throughout Central Australia and Southern Africa. It was also cool, although not anomalously so, in S America, Antarctica and New Zealand at this time. # The structure of the data is one of cyclical warming to circa 1914 followed by cyclical cooling to the mid-1970s followed by cyclical warming to the present day. There is no evidence for warming linked to the 1998 el nino in these data. Nor is there evidence for a pause in warming in the Southern Hemisphere since 1998. # The data presented here are not intended to provide full cover of the Southern Hemisphere. Coverage will be extended at some point. But there is probably sufficient cover to be representative of the southern hemisphere land and surrounding marine conditions. There is scant evidence for significant warming in these data suggesting global warming is confined mainly to the Northern Hemisphere. “The main results have by now already been presented. 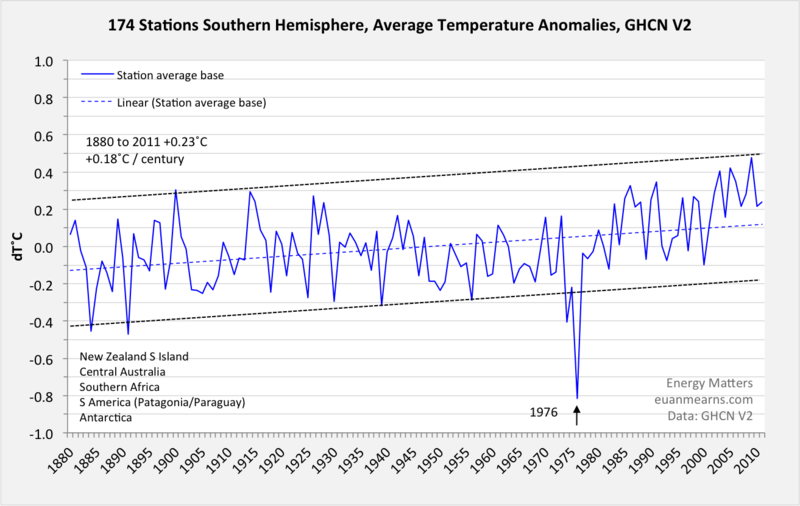 These large areas of the southern hemisphere land mass show little significant warming since 1880. To place this in context the results are re-plotted at a more conventional scale in Figure 5. This shows that from 1880 to 1973 (almost 100 years) the trend was effectively flat. In the mid 1970s, centred on 1976, something strange happened to Southern Hemisphere climate. A marked cool period, accompanied by higher rainfall, gave way to an era of marginally higher temperatures, perhaps 0.2˚C warmer than the previous era. This is what climatologists should be seeking to explain. I do not believe it has anything to do with mankind’s activities. The cool feature centred on 1976 is present in most Central Australian and Southern African records and is very real. It is probably over – represented in this data set since I have 79 records from these two areas (45% of the total records for 31% of the land area). But it was also cool, although not anomalously so, in S America, Antarctica and New Zealand at this time. Roger Andrews, Crutem4 and BEST all pick out this anomaly (see below) but GISS Temp does not. Evidently GHCN V3 homogenisation has homogenised this feature out of existence. 1) Homogenisation of data (adjustments of raw records) that is known to add +0.3 to +0.5˚C to the GHCN V3 series even although the main man-made artefact is UHI that should result in the application of a net cooling correction. Is the GHCN v3 homogenisation residual evenly spread across the globe? Or is it over-represented in the S Hemisphere to mask the inconvenience of little warming across half of Earth? 3) The adjustment of records to a regional expectation (BEST). Does this for example adjust S hemisphere records to a N hemisphere expectation? And are UHI warmed urban records included in that expectation? Has the CRUTEM4 1998 spike been imported from the N as an expectation? 4) The projection of temperatures into grid cells where there are no records. 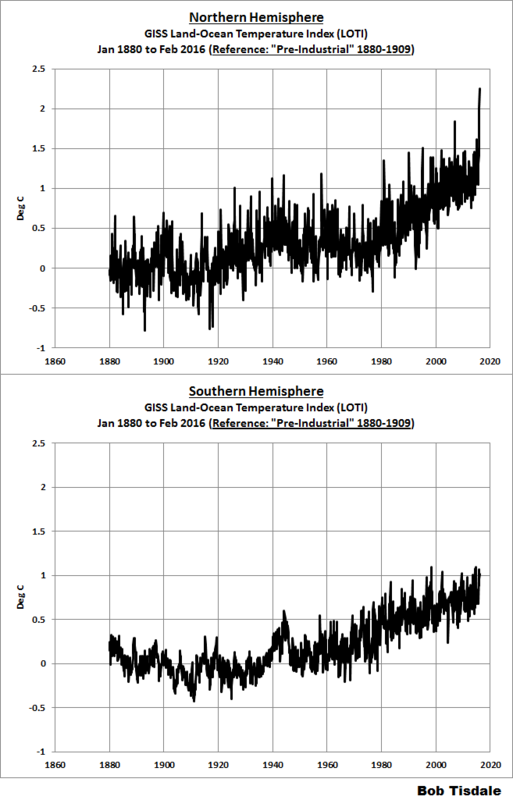 Gee, +0.18 C/century for Southern Hemisphere land temperature since 1880. Scary. [TVNZ] The protest also comes in the aftermath of the hottest ever month recorded worldwide. “If we needed any sort of wakeup call on how rapidly climate change is happening that was it, February was it,” Greenpeace climate and energy spokesman Steve Abel said. January and February 2016 smashed temperature records, the World Meteorological Organization (WMO) said on Monday as it warned climate change was advancing at an “unprecedented” rate. Temperatures in the first two months of 2016 followed a year that broke “all previous records by a wide margin,” the UN’s weather agency said. The WMO pointed to record 2015 sea surface temperatures, unabated sea-level rise, shrinking sea ice and extreme weather events around the world. “The alarming rate of change we are now witnessing in our climate as a result of greenhouse gas emissions is unprecedented in modern records,” the WMO’s new chief, Petteri Taalas, said in a statement. Dave Carlson, head of the WMO-co-sponsored World Climate Research Programme, said the rising temperatures this year were especially alarming. “The startlingly high temperatures so far in 2016 have sent shockwaves around the climate science community,” Carlson said in the statement. WMO confirmed findings by the National Oceanic and Atmospheric Administration (NOAA) last Thursday. The US agency determined that last month was the warmest February since modern records began, with an average temperature that was 1.21 degrees Celsius (2.18 degrees Fahrenheit) bove the 20th-century average. The hike in temperatures during the first two months of the year was especially felt in the far north, with the extent of sea ice in the Arctic at a satellite-record low in February, the agency said. Carbon-dioxide concentrations in the atmosphere also crossed the threshold of 400 parts per million (ppm) during the first two months of the year, WMO said. In 2014, CO2 levels had already risen to 397.7 ppm, which was 143 percent of levels prior to 1750, considered the start of the industrial era. Monday’s report came against a backdrop of the Paris climate talks in December. UN members enshrined a goal of limiting global warming to “well below” 2 C above pre-industrial levels, with a more ambitiouis target of 1.5 C if possible. But Taalas warned that the planet is already about halfway to the 2 C milestone, with no sign of slowing down. “Our planet is sending a powerful message to world leaders to sign and implement the Paris Agreement … now before we pass the point of no return,” he said. “Today, the Earth is already one degree Celsius hotter than at the start of the 20th century,” Talaas said, warning that “national climate change plans adopted so far may not be enough to avoid a temperature rise of 3 C.
There is no reason for alarm anywhere in the Southern Hemisphere, no temperature spike was registered except briefly in SST. And an El Nino is a natural COOLING process i.e. the Northern Hemisphere spike is transitory. The potential for the massive El Niño to transition into La Niña later in the year is one of the hottest topics in commodities markets right now. These fluctuations of sea surface temperatures in the tropical Pacific Ocean can have drastically different impacts on global weather depending on which phase is present – El Niño, the warm phase, or La Niña, the cool phase. They are one of the few clues to seasonal weather patterns several months or even years in advance. The short question-and-answer session would look like this: Are we headed for La Niña toward the end of 2016? Looks that way. Will it be a big one? Not sure. The answers may help dictate whether drought is likely in South America, winter will be cold in the United States or abundant rains will return to Southeast Asia, among other things. Although strength is yet to be determined, the progression of certain atmospheric and oceanic variables will provide clues on the possible entry to La Niña. Particular insight will be offered by the timing of these events, as it might be the difference between strong La Niña and nothing at all. It seems unlikely that we will stay in El Niño, though. Of the 14 El Niño events since 1950, excluding this year, only one of them remained El Niño into the following year, while three others lingered in neutral to weak El Niño territory. So the odds favor La Niña, but in meteorology, odds alone are not enough. A La Niña environment has already begun to develop. Cooler waters are building beneath the surface in the Pacific Ocean and El Niño-supporting trade winds have lessened. But sea surface temperatures, or SSTs, in the defining region of the Pacific remain very warm, so we are still amid a strong El Niño event. It is helpful to look for historical instances in which El Niño turned into La Niña through the course of a year. This has occurred only a handful of times since 1982, but there are enough similarities among these analogs that we can use them to inform this year’s likely outcome. Selected analog years suggest that huge dropoffs of SST anomalies into negative, La Niña-defining territory are likely to take place between April and July. These analogs also suggest that when the SST anomalies cross into negative territory later than June, a weaker La Niña event is likely to follow (tmsnrt.rs/1UkgzEC). Although the journey to La Niña has already begun, there are still some variables that need to fall into place in order to lock in this forecast solidly for the end of 2016. El Niño decay is unlikely to proceed without the shutdown of its two key mechanisms: strongly reversed trade winds in the western Pacific Ocean and net warmth below the ocean’s surface. Check, and check. One of the first anti-El Niño signals was the abrupt strengthening of western Pacific trade winds back to near-normal levels last November. It is probably no mistake then that El Niño reached maximum strength that month (tmsnrt.rs/1UkhtB0). But this has not weakened El Niño as much as it would seem. Localized but strong westerly bursts of wind over the central and eastern Pacific – the Niño region – have propped up SSTs in recent weeks, though the wind bursts have been less frequent since early March. Enter the ocean temperature anomalies. Water temperatures just below the surface across the entire Pacific Ocean have turned net cool, and this massive, cold blob is now lurking below the surface waiting for its chance to turn up. The colder the anomaly becomes, the bigger the potential for La Niña becomes (tmsnrt.rs/1Lt5VZC) (tmsnrt.rs/1UkhRzs). The cold blob can surface in the Niño region with the help of the trade winds. The winds must continue to strengthen, and the pace at which they do so will determine just how soon we might enter La Niña. If the cold blob can keep losing heat at the same pace as recently, other similar years seem to suggest that Niño 3.4 SST anomalies are likely to cross into negative territory one to two months after western trade winds begin their big upward push. This was demonstrated well in 1998 and 2010, both of which resulted in very strong La Niña events. The trade winds have been somewhat mixed in strength this month, though, so we may have to wait until April at the earliest to see a large strengthening in the winds. That means that we could see SST anomalies turn negative as early as June, but there are other factors that could hold this back. Although the cold blob is growing and the trade winds are strengthening, pressure tendencies – the Southern Oscillation portion of ENSO – still highly favor El Niño. The very warm ocean waters over the past year have led to the persistence of lower air pressure near Tahiti relative to Darwin, Australia. This ultimately helps reverse the trade winds and sustain El Niño, and is reflected by a highly negative Southern Oscillation Index, or SOI. But the juice could be running out. Over the past few weeks, the cold blob has surfaced in areas of the Pacific Ocean outside the immediate influence of Niño-region trade winds. The latest SST data shows an expanding cold pool that, if it should close in on Tahiti, may soon and quickly reverse the trend in SOI to favor La Niña (tmsnrt.rs/1Lt66E9). SOI tends to fluctuate a lot, even in the midst of a strong El Niño or La Niña event, but there is a clear separation between the stronger La Niña years and the weaker ones. In the stronger years (1988, 1998, 2010), considerably higher SOI values are already in place by July, while the weaker years tend to bounce around for a bit longer (1983, 1995, 2005, 2007) (tmsnrt.rs/1Lt627j). Another ENSO-supporting variable is the outgoing longwave radiation, or OLR, which is a proxy for thunderstorm activity in the central equatorial Pacific Ocean. Because warmer waters favor atmospheric convection, El Niño is often associated with negative OLR anomalies. This implies an increased presence of towering storm clouds that block solar radiation from escaping back into space. Last month’s OLR anomalies were record negative for the month of February, but like SOI, we would expect these anomalies to start turning positive at some point in the next couple of months in order to assist with the wind-down of El Niño (tmsnrt.rs/1UkhtAY). If we do not see positively persisting SOI and OLR anomalies by July or August, then the potential impending La Niña may be weaker and/or delayed, all other factors aside. Futures traders in the commodities markets seem to be rather more advanced than the climate science alarm community, to which they don’t appear to be listening. “Stunning,” “wow,” “shocker,” “bombshell,” “astronomical,” “insane,”“unprecedented”– these are some of the words climate scientists have used to describe the record-shattering global surface temperatures in February 2016. It’s difficult to see any ‘pause’ or slowdown in the global warming over the past 50 years. Right now, the Earth’s average surface temperature is hotter than it’s been in thousands of years; potentially even longer. “Stupid,” “whoppers,” “suckers,” “baloney,” “astounding,” “insane,”“uneducated”– these are some of the words BS-alert readers have used to describe the record-shattering global media temperature headline silliness since February 2016. […] So, while the global satellite temperature data indicates that February 2016 is the hottest month on record, this pertains to a record that only goes back to 1979. If we consider the much longer surface temperature record for many individual locations across Australia and other parts of the world, February 2016 is not that hot. But this is an exceedingly contentious claim, rejected by a “consensus” of climate scientists that rely exclusively on homogenized temperature series. That is the early temperature records are almost all adjusted down through the homogenization process, so the present appears warmer relative to the past. It is not contested that the official surface temperature records are adjusted, or that the early records are generally cooled. This is justified mostly on the basis of “world’s best practice” and that temperature series should show global warming from at least 1910. I’ve explained the inconsistencies in the adjustment made in the homogenization of the original observed maximum temperatures at Darwin in a technical paper originally accepted for publication in the International Journal of Climatology (see postscript for more information). Back in 1876, the weather station at Darwin was the responsibility of Charles Todd, Australia’s Postmaster General and Superintendent of Telegraphs. His priority until 1872 had been the construction of an overland telegraphic line from Adelaide to Darwin along which he established 14 regional weather stations. Todd’s first passion was meteorology and astronomy, both of which he used in his weather forecasting. Air pressure measurements were important to the weather forecasts being issued by Todd, with these the measurements standardized based on local temperature measurements. It was thus important that local temperatures were accurately recorded. While these records stood for over 100 years, beginning in 1996 the Australian Bureau of Meteorology started “adjusting” all the old temperature records used in the calculation of official temperature trends, including the maximum temperature series for Darwin. What the homogenization process tends to do to the temperature record is not only create a global warming trend where none previously existed, but it also removes the natural cooling and warming cycles so evident in the raw observational data. For example, in the unadjusted maximum temperatures as recorded at Darwin the hottest year is 1907. Temperatures then appeared to cool to 1942 when there is a spike in temperatures. Note that 1941/1942, like 1997/98 and 2015/2016 were El Nino years. These were also years of minimum lunar declination. Unlike modern meteorologists, Todd understood that climate change on Earth is driven by extraterrestrial phenomena. But he would likely have cautioned against single-cause explanations recognizing that there are multiple and overlapping periodicities evident in the history of the Earth’s climate. There are natural cycles that spans tens of thousands of years affected by changes in the Earth’s tilt, and much shorter cycles affected by changes in solar activity. Early 20th Century astronomers and weather forecasters, particularly Inigo Owen Jones, where interested in the planets. They noted decades in advance that 1940/41 would have been a year of Jupiter, Saturn and Uranus conjunction. Todd would have outlawed the practice of homogenization. Scientists of that era considered the integrity of observational records sacrosanct. Clearly the Bureau’s remodeling of historical temperature data is unnatural and unscientific. In erasing the natural climate cycles and generating a global warming trends, the capacity of modern climate scientists to forecast spikes in global warming is greatly diminished, as is their capacity to forecast droughts and floods. 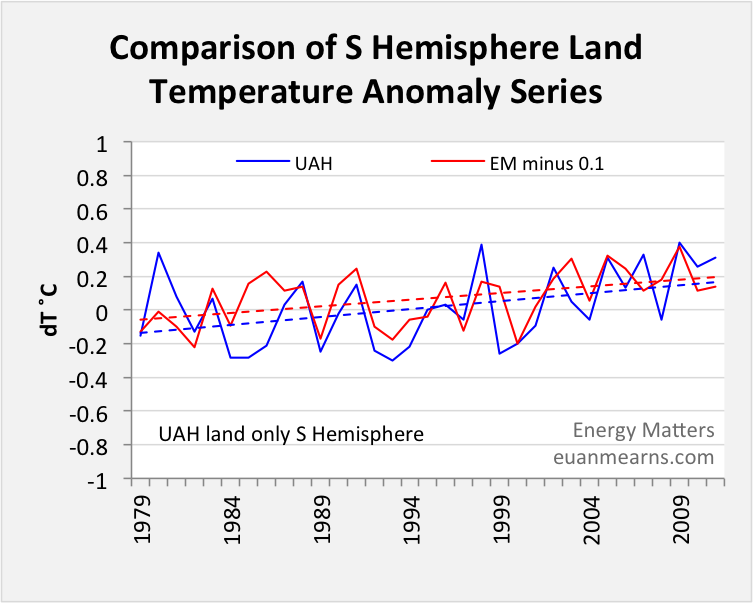 Because of the homogenization of the surface temperature record in the compilation of national and global climate statistics, those skeptical of anthropogenic global warming, have long preferred the UAH satellite record. Even though this record only begins in 1979. The UAH global temperature record for the lower troposphere which once showed no trend for 18 years, now shows a surge in warming. This warming, however, is neither catastrophic nor outside the bounds of natural variability. And it certainly hasn’t been caused by carbon dioxide. ABSTRACT: In any meaningful thermodynamic discussion it is necessary at the outset to clearly define the parameters of the “system” under study. One of those parameters is whether or not the system is “closed”. The typical explanation of the “greenhouse effect” hypothesis pulls a slight of hand in this regard in that it starts out describing the thermodynamics of one “system” with an emphasis on the first law of TD, but then switches twice midstream to different “systems” altogether and asserts that the thermodynamics of the second and third systems mirror the thermodynamics of the first system. If you are already confused you are not alone. The “greenhouse effect” hypothesis is itself very confused. Let’s explore. The first system is the Earth/atmosphere ensemble, whose “boundary” is space and whose two thermal energy sources are 1) incoming sunlight and 2) internal nuclear decay. In this system the thermal energy that crosses the “boundary” between the system and its surroundings is 100% electromagnetic. There is absorbed sunlight (insolation – albedo) in and long-waver IR radiation out. According to the first law of thermodynamics for this entire Earth/atmosphere ensemble system to be in thermal equilibrium the total energy contained within the sunlight absorbed must equal the total energy contained within the outgoing long-wave radiation. The “greenhouse effect” hypothesis asserts that an increase in the concentration of “greenhouse gases” inhibits the ability of the entire Earth/atmosphere ensemble “system” to emit long-wave IR radiation out into space. In the language of radiation thermodynamics, “greenhouse gases”: make the entire Earth/atmosphere ensemble “system” less “emissive”. The “greenhouse effect” hypothesis then switches mid-stream to a completely different thermodynamic system—a one-meter thick layer of air about 1.5 meters off of the ground. This is where weather stations are sited, whose temperatures are averaged along with sea surface temperatures to create the “global mean temperature”. Thus, the “greenhouse effect” hypothesis assumes that the entire Earth/atmosphere ensemble system is retaining excess thermal energy based on the temperature of hottest 0.02% of the ocean combined with the hottest 0.0002% of the atmosphere. Were they to base their calculations on the average temperature of the entire troposphere, which contains 85% of the atmosphere’s mass, no retention of thermal energy would be suspected since the average temperature of the entire troposphere is well below zero °C. What are the characteristics of this second thermodynamic system? Let’s just look at the land based portion of this “second system”. Its “boundaries” are imaginary dividing lines below and above a one-meter thick layer of air about 1.5 meters off of the ground. 1) Convection: This second system is completely “open” in that air is continually moving into and out of the system carrying thermal energy into and thermal energy out of the system. 3) Radiation: Only a small amount of thermal energy enters this second system via IR radiation since most of the “net radiation heat loss” from the ground up-ward via up-going long-wave radiation passes straight through this system because of its “transmissivity”. 4) Latent heat: There isn’t any liquid water in this system (except when there is fog) so little or no thermal energy is lost due to evaporation, but this system does gain thermal energy at night when some of the water vapor present in this layer condenses into dew. Let me elaborate on #3, the Radiation portion of this second system’s thermodynamics. In a study that I did using surface radiation readings at a SURFRAD site in Desert Rock Nevada in the summer 2012, on cloudless days the up-going “net radiation heat loss rate” from the ground was 119 W/m2. Since the calculated “transmissivity” of the air in this very arid climate was 0.26, 109 W/m2 passed straight through the system in question (the one-meter thick layer of air about 1.5 meters off the ground) without thermally interacting with the system. Thus, the amount of “heat” that was being transferred from the ground into this second system on the hottest, cloud free days within this desert climate was only 10 W/m2. While 109 W/m2 of up-going IR radiation was passing straight through this ground level layer of air leaving only 10 W/m2 of “heat” to be absorbed this same ground level air was emitting 299 W/m2. Since the air above this “second system” also had a transmissivity of at least 0.26 we can calculate that the up-going “radiation heat loss rate” from this “second system”. It was 77.4 W/m2. As you can see, from these simple calculations drawn from standard radiation thermodynamic using surface radiation readings being gathered by NOAA, this second system (whose temperatures are being averaged to create the “global mean temperature”) loses over 7 times as much “heat” via IR radiation upwards as it gains via IR radiation from the ground! 10 W/m2 of “heat” is transferred via IR radiation into this “second system” through the lower boundary of the system, while 77.4 W/m2 of “heat” is simultaneously being lost via IR radiation through the upper boundary of the system. Contrary to this physical reality, the “greenhouse effect” hypothesis asserts that IR radiation is somehow causing “heat to be trapped” within the system under study, thus forcing its temperature to increase. As you can see, the increased humidity in Mississippi increased the ratio of radiative heat loss to radiative heat gain in this second system from ~1:7.7 and in Nevada to ~1:10. This is not inconsistent with radiation thermodynamics since increasing the emissivity of matter enhances its ability to cool via IR radiation and, indeed, water vapor increases the emissivity of air. Before we move on do not think that these findings conflict with the Kiehl and Trenberth’s generally accepted Earth Energy Budget. Applying the same mathematical formulae as above to the KT Earth Energy Budget we see that globally the ongoing average amount of “heat” (net radiation heat loss rate) that is being transferred from the ground to the atmosphere via IR radiation is only 26 W/m2, while simultaneously the ongoing average amount of “heat” that is being transferred out into space by the atmosphere via IR radiation is 195 W/m2. This is a 1:7.5 ratio of atmospheric “heat” gain via IR radiation from the ground to atmospheric “heat” loss via IR radiation out into space. In other words, for every 1 W/m2 of heat gained via IR radiation from the ground the atmosphere disgorges 7.5 W/m2 via IR radiation out into space. From where does this extra energy come? From “thermals”, from “latent heat transfer” and from sunlight absorbed directly by the atmosphere on it’s way in. The idea therefore that “greenhouse gases” are somehow causing the atmosphere to “trap heat” simply doesn’t jib with the actual thermodynamics of the atmosphere. Stated directly, the “greenhouse effect” hypothesis is false. Thus the believers in the “greenhouse effect” hypothesis had to create a third imaginary system. In the third system the entire atmosphere is replaced by a single thin pane of magic material that is 100% transparent to down-going sunlight while simultaneously being 100% opaque to up-going longwave radiation. In other words at some wavelength the pane of material magically changes from being a “white” body to being a “black” body. Beyond that, this pane of magic material is, unlike the atmosphere, separated from the ground by a layer of vacuum thus making the thermodynamic relationship between the ground and the atmosphere 100% electromagnetic. Gone are convection, i.e., the movement of thermal energy into and out of the system via mass transfer, conduction and latent heat transfer. The majority of the mathematical formulas being taught within institutions of “higher learning” that presume to explain and quantify the “greenhouse effect” hypothesis apply to this third imaginary — non-existent — system and thus have no connection whatever to the real world thermodynamics of the atmosphere, which is what science is suppose to study. The idea therefore that “greenhouse gases” are somehow causing the atmosphere to “trap heat” simply doesn’t jib with the actual thermodynamics of the atmosphere. Stated directly, the “greenhouse effect” hypothesis is false.</blockquote? Ok, let's think of this in view of the current EL Nino-driven "GMST" spike which, although it has alarmists hyperventilating, is predominantly a Northern Hemisphere phenomenon for this event. And it is a surface COOLING event. The relatively negligible thin air layer of the earth's surface measured for "GMST" has received a temporary influx of energy (heat) from the ocean, detected only in the NH. The heat is not "trapped", it is in transit from sea to space via the surface layer (except for the IR radiation which passes straight through the "window" without interception – see K&T diagram). Thermometers detect this heat-in-transit as it passes up through the layer. Eventually, as the El Nino passes, OLR goes from normal to less than normal to greater than normal and back to normal i.e. the El Nino heat-in-transit transits from sea to space. And there is no “heat trapping greenhouse effect” as proven by an El Nino which is basically heat transfer from sea to space i.e. COOLING of the earth’s surface, NOT heating. Any heat accumulation in the planetary system occurs in the giant oceanic heat-sink (not in “GMST”) when solar input over time exceeds dissipation. An El Nino is simply an abrupt oceanic heat dissipation process. “GMST” simply detects heat-in-transit from sea to space, NOT heat accumulation. That’s my comment from then on, not Brehmer’s. Inattention and browser without edit for some reason (Opera). I was watching ‘Last Call at the Oasis’ on Maori Television and compiling a comment simultaneously. ‘Last call’ is the 2011 water crises alarm doco featuring Erin Brockvich and …………Peter Gleick. Some good stuff on water pollution and bottled water but the “climate change” alarm looks silly since rain in Australia and California. Needless to say, I find the anomaly neither “astronomical,” ”staggering” or “strange.” from a SH perspective. The heat-in-transit from sea to space has been concentrated in the NH [rather than evenly distributed north – south]. The GMST Illusion, WMO version (also upthread). Written by Michael Bastasch, Daily Caller on 22 March 2016. “The alarming rate of change we are now witnessing in our climate as a result of greenhouse gas emissions is unprecedented in modern records,” Petteri Taalas, secretary-general of the World Meteorological Organization, said March 21 in a statement on the release of the group’s’ new climate report. WMO’s new “State of the Climate” report says the global average surface temperature was 0.76 degrees Celsius above the 1961-1990 average because of man-made global warming and the current El Niño — something Taalas glossed over in his remarks. Taalas, however, wasn’t alone. David Carlson, the head of the WMO-sponsored World Climate Research Programme, claimed climate scientists have been shocked by how much temperatures spiked so far in 2016 — again, while a naturally-occurring El Niño warmed up the tropical Pacific. “The startlingly high temperatures so far in 2016 have sent shockwaves around the climate science community,” Carlson said in a statement, echoing Taalas’ alarm. Amazing how these alarmists misconstrue localized heat-in-transit and surface COOLING – for “global” “warming”. Stephen Sherwood, an atmospheric scientist at UNSW-based ARC Centre of Excellence for Climate System Science, said the recent surge in warming indicates the slowdown in surface temperature increases of the past 10-15 years is over. Heh. What will Sherwood say when the spike drops right back out of the model range to neutral after the El Nino? Not to mention the very real possibility of a La Nina (Gaia forbid it’s a strong one). But then, Sherwood is at the “ARC Centre of Excellence for Climate System Science” so who am I to doubt his excellence? So sayth the man [Sherwood] who “predicted” one hot month in two decades and finally got lucky? Now, despite the models being wrong for 18 years, in a flicker they are “right”. Three years from now if the pause still exists will he give up his job and pay back the salary? How exactly, is this a “surge in warming” (Sherwood)? GHGs didn’t “trap” past El Nino heat (temps returned to neutral) so why should this one be any different? Or is this El Nino heat somehow different in that GHGs will trap the heat i.e. air temperature will remain elevated and will not return to neutral this time? “Its just nonsensical, denialist drivel” apparently. “Utter pseudo scientific drivel”, “[in]comprehensible”, and “[un]intelligible” too. How can these people possibly critique IPCC Assessment Reports or peer-reviewed scientific papers or the man-made climate change conjecture in respect to the IPCC’s primary criteria? Let alone address simple questions as above. They don’t even know the source of this El Nino heat in the troposphere (Renowden and Taylor) or agree on where it exhibits in the metrics (Kiwiiano and SimonP) i.e. they can’t deduce from graphs either. Any more than about 2 (inconvenient) sentences and their eyes glaze over (excepting Andy here). NH February was +55 more than the mean, +37 more than NH January, and by far the highest anomaly. SH February was -54 less than the mean, but didn’t eclipse SH October 2015. It’s tale of two hemispheres. GMST is a totally meaningless illusion. Think of that plotted as per SMH graph.